The farmer's hat is a Korean go term adapted into English. It is a bad shape, named by analogy is to the cone-shaped straw hat worn by medieval Japanese warriors and later farmers. It is essentially an empty triangle with an extra stone added to form a second empty triangle, and bad for the same reasons that the empty triangle is bad. The farmer's hat may also refer to the four-space T-shape killable eye shape, please refer to pyramid four for the killable eye shape. is almost always bad. White should normally play at a or b instead. White's shape after is called jingasa in Japanese, which corresponds to the Korean term (See here and here). 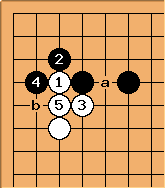 However, jingasa is also defined as having two empty triangles (see here , here, and The Go Player's Almanac), which this shape does not, so there is some uncertainty about whether this example is correct usage.